A meeting of the Women’s Southern Nevada Golf Association (WSNGA) was held at the Las Vegas Country Club on June 4. President Sherry Jackson called the meeting to order promptly at 8:30 a.m. All Delegates were present with the exception of State Delegates Beth Greene and Ronda Henderson as well as Parliamentarian Dolli McPartlin. A motion to approve the minutes from the March 12 meeting was made by Sherry Jackson and seconded by Sue May. All those in attendance approved. The Treasurer’s Report for April was read by Jackie Pierson. As soon as May’s report is completed it will be dispersed through email. A meeting was held in the spring with SNGA to determine a budget for WSNGA for 2018. Due to the USGA’s initiative to reduce golf associations, WSNGA will be working under SNGA. SNGA will be taking over some of the costs WSNGA has paid in the past such as for rules and course ratings. SNGA will also provide insurance, office supplies, etc. In the past, WSNGA has received a significant portion of the handicap fees paid by women to SNGA. That portion has been reduced to $6,000 per year by SNGA due to the reduction in costs for WSNGA. The 2018 Proposed Budget was read by Jackie Pierson. After no further discussion a motion was made by Sue May to approve with a second by Jan Hansen. All those in attendance approved the 2018 Budget. Subsequent to the Budget approval, Sheryl Mayes posed the question of whether the dues will be increasing to cover Handicap fees. Ann Sunstrum stated that they are currently $30/person and there has been no discussion at SNGA to raise them. Jan Hansen posed the question of the “more than 1 membership rebate”. Ann Sunstrum instructed us to go to SNGA.org, hover over the Join tab then use the drop down menu to find the Rebate tab. You can fill out the form and in the Notes Section you can mention which clubs to which you belong. There is a $20 rebate for each additional membership but they will double check that you are actually a member of multiple associations. Tournament Chair- Monica Fairbanks, although present was unable to speak so President Sherry Jackson read her report. The Fun Day at Mountain Falls and the first combined Fun Day with the men at Dragon Ridge were mentioned as a great success. 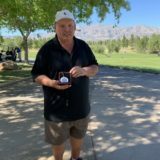 The Southern NV Sr. Am was held at Chimera with approximately 50 players with Regina Quintero as the overall gross winner and Susan Daum as the overall net winner. The article happened to be in the Review Journal this past week. The So. NV Am and Silver Cup Qualifier: June 23-24 @ Legacy Golf Club. **Note that the start time has changed to a 7:30 shotgun and not the 9:00 am tee time as originally printed on the entry form. Silver Cup Captain Karen Herness reported that there are only 40 players signed up and would really like at least another 10 more to get the depth we need to bring the Cup home to So. NV. Just to get an idea why participation is so low, she would like you to please ask your ladies why they have chosen not to participate. Could it be the date, time, course, commitment? It should be stated that the course is in great shape, the tee time changed to earlier so it won’t be as hot and per Karen Herness you will not have to be here for the 5 1/2 months to practice. She and Rusty understand that some ladies leave the area for the summer but wherever you are you can still practice on your own. There will not be any mandatory practices until September and partners will not be assigned until much closer to the event. She mentioned that Chimera’s ladies’ day is on Thursday with a 7:30 shotgun and perhaps those that qualify could practice on those days. We have also received a request for a re-rate at Falcon Ridge in Mesquite for both the Men and the Women’s tees which we are evaluating. Due to heat and over seedings there will not be any additional course ratings during the Summer. Before reading her report she wanted to thank Dee Molina for all her help and support through the year. She really had her back! Phase 1 – Regular Season play is complete and the Playoffs are June 11 at TPCLV 7:30 am shotgun. Phase 3-Team Play Party at Southshore Monday July 9 @ 8 am. Your team must be sent to Dee Molina by June 15 and monies to Jackie Pierson by the same date. Rules Seminars-Sue is willing to go to your clubs anytime in November or December to give a seminar on the changes that will be coming in 2019. She will usually come out and play with your group and then afterwards give the Seminar. Please email her to get your club on her calendar. If your club has less than 20 members she suggests that you combine with another club. There is also a USGA Seminar in Las Vegas Sept 15-18 and the cost is approximately $350. You can sign up at USGA.org. Common sense rules that NO CASH CAN COME FROM AN ENTRY FEE. Your Invitationals should be paid out with gift cards from anywhere you choose, whether it be your golf shop, grocery stores, Visa gift cards, etc. However, if your KP/Hole-in-One or other skill challenges are sponsored and do not come out of the entry fee, you may pay cash. Be sure that there is no ambiguity as to where that cash came from and perhaps announce how the donation was generated. As for your game of the day, buy-ins should be OPTIONAL and NOT MANDATORY. If perceived as mandatory and cash is being paid out, there is a high possibility that you are putting your members at risk of losing their amateur status. Dee Molina asked what difference it makes from a common-sense perspective between giving cash and giving a gift card. Sue indicated that we are to support the rules given to us by the USGA and are given no leeway. Secretary Monica Kaili asked where we could donate items to Junior Golf. Ann Sunstrum stated that donations are accepted at the SNGA office located at 8010 W.Sahara Ave. # 160. It is open M-F from 9 am – 5 pm. Their phone number is 702 430 2600. Rally for the Cure @ TPC Summerlin: Applications are available to be picked up and will be sent out in a separate email. **Note** Originally scheduled for Sept 24 but we were unable to reserve the room so the date has changed to Sept. 10. A meeting of the Women’s Southern Nevada Golf Association (WSNGA) was held at the Los Vegas Country Club on March 12. In the absence of President Sherry Jacson, Vice President Karen Herness called the meeting to order at 8:35 a.m. Those absent included Delegates from Dragon Ridge, Red Rock, and Siena as well as State Delegate Sue May, Communications Delegate Ann Sunstrum, Parliamentarian Dollie McPartlin and Course Rating Chair Jan Hansen. Before the minutes from the January meeting were approved we had a guest speaker from Junior Golf-Nicole Dutt. She had information on the program and its function in Southern Nevada. The letter includes a challenge between the women’s and men’s groups to see who can donate more money. A copy of the letter is available at the end of the minutes. A motion to approve the minutes from the January meeting was made by Monica Fairbanks and seconded by Ronda Henderson. All those in attendance approved. The Treasurer’s Report was read by Jackie Pierson and were sent out in previous emails from Secretary Monica Kaili. Tournament Chair Monica Fairbanks reported on future events and dates for 2018. Course Rating Chair Jan Hansen was absent due to rating Eagle Crest however, Jackie Pierson was present to read her report. 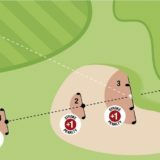 Rio Secco made some significant modifications to the course by adding several new forward (Red) tees which shortened the course by 440 yards. It also removed some bunkers and changed some greens with the goal of making the course more user friendly. Four women and four men from the rating team attended a Course Rating Calibration Seminar in San Mateo on March 4 and 5. This is a rating seminar for more advanced raters. I am pleased to say one of the women achieved 100% on the rating quiz and the other three of us missed only one question. We beat the pants off the men. There will be no significant changes to our rating procedures until after the proposed rule changes are finalized in 2019. Co-Chair Dee Trimble reported on Team Play. She made several points. 1-So far there have not been any problems or complaints with pace of play issues. 2 -Boulder City, Business Women, Oasis and Chimera are doing great in the standings. 4-Dee Molina will not continue on as coordinator in 2019 so a new coordinator will be needed Computer Skills a must. Jackie Pierson mentioned that a copy of a canceled check for Team Play at LVCC is needed from Sun City Summerlin. Ronda Henderson brought to our attention that after the State Partners event Sherry Jackson had contacted the USGA regarding how to post for a Best Ball event. She was advised that those scores should NOT to be posted. Further discussion was prompted for our Team Play events on how we should proceed. The issue was taken under advisement by the coordinators but not resolved at this time. **A Correction was sent out in an email from S. Jackson regarding the proper procedure. Secretary, Monica Kaili mentioned that she was informed by several delegates that they are not receiving her emails. She would be available after the meeting to get your correct emails to ensure that this does not continue. The next meeting date was set for June 4, 2018. With no further business to come before the Board, the meeting ended at 9:05 a.m. The first fun day for 2018 will be at Mountain Falls March 7, 2018. No date but the venue for the Southern Senior Am will be at either Las Vegas National or Spanish Trail. Rebate request for multiple memberships in place on SNGA website. If you have paid for multiple memberships for SNGA/GHIN you are eligible for $20 back for each membership after the initial one. EXAMPLE: you have PAID for GHIN through Business Women, Muni, and Revere. You would get $40 back ($20 for the 2nd & 3rd one). This is not automatic you must apply for it. To do so go to the SNGA web site: www.SNGA.org, click on the tab at the top “Join” click multiple memberships – complete and submit the questionnaire. The rebate will be mailed to you. The Jr Americas Cup was a successful event. The cost of the event was $64,000 and SNGA/SNJGA was able to raise $62,000. The Women’s Associations around the valley were instrumental in contributing towards this event. The next meeting is November 13. A meeting of the Women’s Southern Nevada Golf Association (WSNGA) was held at the Las Vegas Country Club on June 19, 2017. President Sherry Jackson called the meeting to order at 8:35 a.m. Delegates from Oasis, Siena, Sun City Anthem/Revere, Wild Horse and Paiute were absent. State Delegate Beth Green was absent. Committee Chair Sue DeFrancesco was absent. Officer Dollie McPartlin was absent. The minutes of January 16 and April 3, 2017, were approved as written. Treasurer Jackie Pierson gave the Treasurer’s Reports for March, April and May, 2017. March began with a balance of $33,202.62. The income came from Team Play and the Fun Day at Mountain Falls. Disbursements were $7,438.00, most of which was outlaid for Team Play and Fun Day. There was and bank balance of $38,478.62. The savings account has a Balance of $10,285.45. April began with a balance of $38,478.62. All of the income was from Team Play. The bulk of disbursements were mostly related to Team Play. April’s ending bank balance was $20,785.62 and the savings account balance was $10,285.62. May began with a bank balance of $20,785.62. Again, most of the income was from Team Plan with almost $9,000.00 coming from the Senior Amateur and Southern Nevada Amateur. Total Disbursements mostly related to Team Play and Playoffs and totaled $7,906.09. Ending bank Balance was $35,842,53. The savings account balance was $10,285.79. Tournament Chairman Monica Fairbanks reported on the Senior Amateur. The overall gross champion was our own President Sherry Jackson and overall net was won by Monica Kailli. Complete results are on the WEB site. She announced that the Amateur/Silver Cup Qualifier would be held the following week. There are 49 people signed up—twenty-one trying to qualify. For the Fun Day at Las Vegas Country Club, there are 54 individuals signed up. She then discussed future events. There will be a possible combo with Business Women. President Jackson reported on some of the upcoming State events. The State Amateur is to be held July 23rd through 25th at Paiute. Signups are so small that the event is threatened with cancellation. She encouraged the Clubs to talk to the members and put up flyers at their specific clubs. E-mails have been sent to the people who played the previous year. She feels that the fact the State split the Senior Amateur from the State Amateur and moving it down to Las Vegas in the middle of July might not be such a great idea. She said that everyone would be notified if it were cancelled. It might possibly be combined with the seniors at Primm. It was originally only supposed to be a gross event but it has been changed to pay both gross and net. After considerable discussion on the several possible reasons for no turnout, President Jackson advised that everyone would be advised as to what happens. Chair Jan Hansen gave the report on course ratings. The team completed the rating of Red Rock Country Club—Mountain Course, Royal Links and a temporary rating for Canyon Gate because of temporary greens. A course rating has been scheduled at Sunrise Vista (Nellis) for July 24th and 26th. The remain- ing courses needed to be rated are the following: Angel Park Palm; Desert Willow; Eagle Crest; Las Vegas Golf Club (Muni), Revere (Concord and Lexington); Stallion Mountain and The Summit. The schedule is very busy for 2017 and will get other requests such as Canyon Gate when all 18 greens have been re-done. Chair Hansen also called attention to the fact that both Committee Chairs Sue May and Ann Sunstrum were featured in the latest edition of Golf and Leisure – Sue May making the cover. Co-Chair Dee Trimble reported that team play was over for the season. She stated the year was very successful and a wonderful party was held at Cascata. She announced that Rhonda Powell would not be the Co-Chair in 2018 and expressed appreciation for all the work that she had done. June 19, 2017 Page 3 the western states, Mexico and Canada. 2017 is the 40th anniversary of the event and will be hosted by the Southern Nevada Junior Golf Association at Reflection Bay Golf Club. It will be July 29th through August 3rd. Volunteers are needed in many areas such as assembling gift bags; registration; shuffling players between holes; greeting and directing players and coaches; pace of play and live scoring. She expressed appreciation to all of the clubs that have donated their time. She states that they are still having a difficult time finding housing for the girls. They are seven houses short and really need help. She distributed packets asking volunteers to sign up and list the areas in which they would be most interested. SNGA Liaison Deb Koch announced that the Golf Genius software is on the way. There is a free version and a version that costs $2,500.00. There’s not too much difference in them. The more expensive version has a little bit more online information, browser, phone and apps. Delegate Sue May reported on the USGA State Team Play. The dates are September 26th through 28th. They are going to disband the tournament. Delegate May did not know whether or not we wanted to pay the money to send a team this year. It will be replaced with the disability/handicapped tournament. The next meeting date was set for September 11th, 2017 at 8:30 a.m. at the Las Vegas Country Club. With no further business to come before the Board, the meeting adjourned at 9:10 a. m.
Fun Day will be March 22nd at Mountain Falls, Pahrump. * State Partners March 6-7 at Anthem CC. This entry is available and has been sent out. Can be obtained from the NSWGA website (there is a link to this from the WSNGA website). * State Amateur July 23-24-25 at Pauite. This years tournament will remain a gross and net event. It will be open to any female in the State of Nevada. Las Vegas Country Club to be rated this week. Upcoming – Summerlin (Palm Valley, Eagle Crest), Angel Park – Palm, Desert Willow, Las Vegas Golf Club, Revere, Stallion Mtn, Sunrise Vista (Nellis AFB) and Royal Links. Royal Links is under new owership. 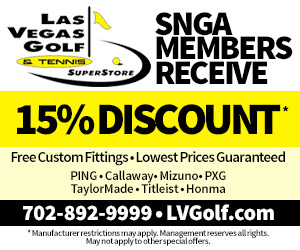 Southern Nevada Golf Assoc. met with the Arizona State Golf Assoc. and have signed a letter of intent to be included under their umbrella for USGA franchise. The major plus from the meeting, there will be no change in the way SNGA operates. This should not impact tournaments, etc. The SNGA membership fee (our GHIN) has been increased $5.00 to $30.00 effective 1/1/2017. Next meeting: April 3, 2017 @ 8:30 a.m.